Soccer goalkeeper gloves are a must when your kid choose the role in the goal. The speed and force of ball kicks increase exponentially these days and no goalkeeper wants to be exposed with bare and unprotected hands. However, the best soccer goalkeeper gloves are not just about protection but also about holding, catching and throwing the ball. Here are the important features and parameters you have to check when choosing the right gloves for your kid or you. Weather is an important parameter when choosing the right soccer goalkeeper gloves. You will need gloves with better grip and insulation for windy and rainy conditions than a normal one. 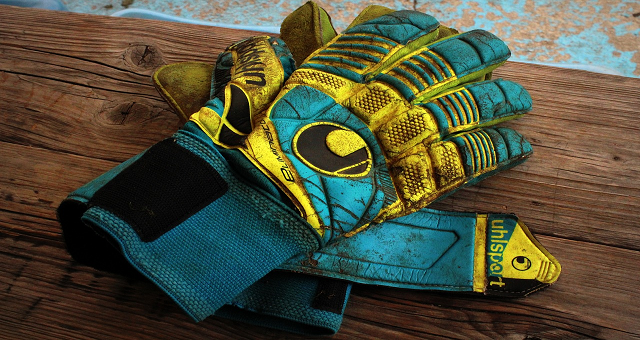 Your goalkeeper gloves should also be water resistant and keep your hands dry and ready for saves. It is good to have two different pairs for different weather conditions. Goalkeepers in past had a different match and training gloves. Now as goalkeeper gloves are made from a more durable material, elite goalkeepers prefer to use the same gloves for training and matches. It is important to get used to equipment before the important match. It does not make sense anymore to have different pairs for training and match. Goalkeeper gloves are made from a combination of foam and latex. More expensive gloves use more latex on a backhand and are considered as better quality. There are four basic parts of every soccer goalkeeper glove. Goalkeeper uses backhand of glove for punching the ball. The backhand should be significantly padded to keep the hand of goalkeeper safe and also give enough strength to the punch. The fingers are very important in grasping and holding the ball. The goalkeeper needs good maneuverability of fingers, but also the safety from injuries caused by balls. Therefore good goalkeeper gloves have stiff and flexible spines inserted into backhand of gloves. Stiff spines prevent finger hyperextension, flexible spines provide support and flexibility to fingers. The palm is important in holding and catching the ball. There are different textures of goalkeeper gloves palms. On one side of the scale, we will have smooth palms on other side dimpled palms. Also, the level of thickness in millimeters is important ( 3 – 4 mm thickness is most common). Keep in mind that thinner gloves give you a better grip, but they are less durable. Thicker palms are more durable and give goalkeeper better protection, but the feel on the ball is worse. The closure fastens the glove to your hand. There are four types of closures currently used. Hook and loop, V-notch, bandage and new Nike wrist cuff. Hook and loop closure is a strap from an elastic material which can be easily tightened or loosened. V –notch closure keeps your hands cool and dry thanks to vented entry. Bandage closure is similar to a medical bandage and gives the best support to your wrists. Wrist cuff is new invention used by Nike in their Mercurial Touch Elite. Read more about Nike Mercurial Touch Elite – soccer goalkeeper gloves revolution. Soccer goalkeeper gloves are usually slightly larger than normal gloves. Popular opinion says that you should measure the circumference of your hand in inches. Measurement should be done on the widest part of your hand and should not include fingers or thumb. You will get a measure in inches. Then you should round this number up to the closest whole number. Then add 1 to the rounded number and you will get the soccer goalkeeper gloves size. If you check websites of gloves manufacturers, you will get slightly different sizing tool. You should measure the width of your hand (not circumference) and then choose the right size according to the table below. If your measure is in the middle of two sizes, choose the larger. 4 1 ¾ - 2 in. It is better to have two different goalkeeper gloves pairs (one for rainy and one for normal weather). Soccer goalkeeper gloves should be slightly larger than your hand. Goalkeeper gloves should be like a second skin for a goalie, so use the same pair for training and match to get used as much as possible.